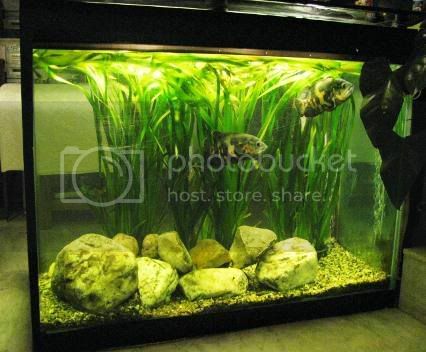 This is a tank in my living room in Bhopal. It acts as a nice bar for us. The plants are only Giant Vals. in pots. it is easily around 4 years or so. The rocks are plain white boulders, we took from our rock garden. There used to be 4 more Oscars but we lost 2 about 3 months back. And after these 2 laid eggs my dad gave away the other 2 as well. So now only these 2 live here peacefully. I know they are not the prettiest Oscars out there but I still like them. I was thinking of adding 4 fire mouths to them, but i need to find quite big fire mouths. Anyhow I hope you like them. NOTE: There is one big white boulder missing from the right corner to complete the set. Thats because they had eggs on them and my Dad wanted to separate them. ..I dont remember it exactly thats why I didn't mention. so ya an external Canister. Also No Co2 and no dosing or anything, just MP's black soil. The tank gets lot of sunlight in the summer tough. In absence of you who looks after those cute monsters?Dad or Mom? Dad. He added plants to this tank after I started to keep plants in my tank. About 3 months ago while he was in Mumbai we picked these plants up. Her has set this up by himself, more to say these are his pets than mine. I am glad he is getting into planted tanks too. I found this an interesting setup, as this is one of the few tanks with Oscars and plants.And since it is plain gravel it is very easy to mantain, there only a 50% WC once a week and thats all that is done to the tank. except for scrubbing the side walls. Nice tank! I like the simple look. Whats the lighting? 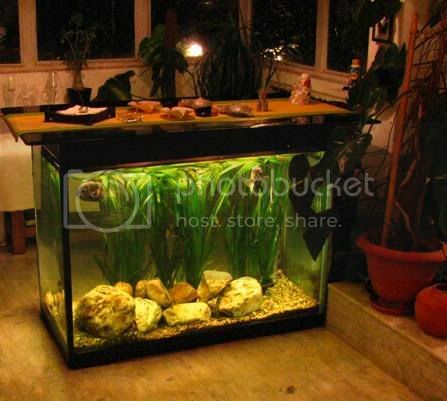 You can add a few medium-large firemouths in this tank without much fuss or even jewels(only males better), salvinis, severums(might graze on vals), sajica, gold saum, texas, dempsey, etc., in there. I cannot see any aeration in the tank. Oscars are large fish and would require aeration. During Lights ON, the vals would give off enough oxygen, but what happens at Lights OFF??? Maybe the other two Oscars died of oxygen hunger!! @tims: you cant see areation as the outlet is at the back right corner. If you look at the reflection of it in the glass in the second pic. @Hamza: My dad simply cant stand pleco's so none of them for this tank. I want to add Large fire mouths to this they would look nice. The Lighting is 1x36Watt PL. Yup. Saw the aeration in the reflection in the 2nd pic. I agree with Hamza....a Pleco would really help. You can try some fancy n rare ones if you dont like common plec. oscars in planted aquaria??? is it advisable?? ....I'll let the experts answer. But this has worked for me for over 3 months now. Yes, oscars are known to move things around and tear them down if they dont like 'em. They push the plants any which way they like. The boulders are too big for them to budge and the pots are below the boulders so there is no chance for them to move them around. I see nothing wrong with this setup Oscars + Hardy Plants seem to be fine. OK I will try to find one and convince him, I like the zebra ones but they are rare to come by. Not only are the Zebra Pleco rare to find but they are bloody expensive as well. I am also not sure if they will survive for long in the oscar tank. They are not to clean the tanks as the other plecos do. @Sridhar : what do you suggest to add to the tank then. He just cant stand the normal plecos'. How about the Chinese Algae Eater? Will it clean my vals? Though they become a bit territorial, they are no match for Oscars? The orange one might look nice in this tank as well. What else can I add? as cleaners?